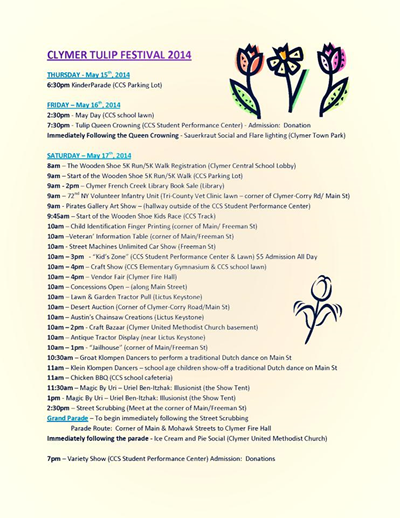 The Clymer Tulip Festival had its inception in 1953, when the Clymer Community Club instituted a Clean-up Day in the interest of community improvement. The events that afternoon in May included street scrubbing (an OldDutch custom) and a small parade consisting of the High School Band, a Club Float and several of the inhabitants dressed in authentic Dutch costume. In 1954, out of town school bands were invited to participate in parade competition. another attraction was the scrubbing of the streets, which has been practiced ever since. The following year the various organizations were asked to sponsor a Queen candidate, the first Tulip Queen was crowned that evening, the Hobby Show and souveniors were added, and the affair became known as the Tulip Festival, drawing in the intervening years the crowds of spectators from all over the globe. Innovations since that time have been the famed Klein and Groat Klompen Dancers, the Evening Program, Flower show, antique displays, and old-fashioned hand crafts. The Klompen Dancers also made guest appearances throughout the area during the year!